Samaritan’s Purse, an international Christian relief organization, specializes in meeting critical needs for victims of war, disaster and famine. For decades, Samaritan’s Purse deployed mobile medical teams into disaster zones, but they still saw a pressing need for advanced emergency trauma care. In 2011, the organization began actively developing the emergency field hospital—a mobile unit that functions as a complete hospital equipped with two operating rooms, an emergency room, critical care unit, and pharmacy. The emergency field hospital is mobile and ready to deploy at a moment’s notice. It provides emergency medical relief in disaster-stricken areas where the medical infrastructure is damaged, overwhelmed, or nonexistent. 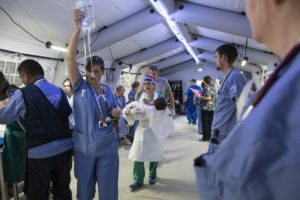 Participants at this year’s M3 Conference will be able to walk inside the wards of the emergency field hospital, see first-hand how it is equipped to facilitate high-quality care anywhere in the world, and meet members of the Samaritan’s Purse medical team who have treated earthquake survivors in Ecuador and victims of war in Iraq. From the outside, the Samaritan’s Purse emergency field hospital looks very similar to the mobile hospitals used by other organizations. What sets it apart, however, is that the medical work that goes on inside is about both physical and spiritual healing. Medical personnel and non-medical staff minister to patients, pray with them, and share the hope of the Gospel in the midst of the disaster. We encourage you to visit the mobile hospital during M3 to learn how you can join Samaritan’s Purse in providing high-quality medical care after a crisis. Read more about the life-changing impact that the field hospital has brought to patients in need. Click here to register for the 2018 M3 Conference and experience the Samaritan’s Purse emergency field hospital for yourself! We at M3 hope you had an amazing Christmas and were able to enjoy this special time of year with the ones you love. To help the Christmas celebration continue, we have another 2018 M3 Conference speaker to introduce to you. Yancy Stermer is definitely nothing short of interesting, and we are so excited to have him as part of the team this coming conference! Retired from the US Army after 21 years of service and 7 more years in uniform teaching JROTC at a private military academy, it was time for a career change. Yancy went back to school completing a degree in Surgical Technology and certification as a Surgical Assistant. 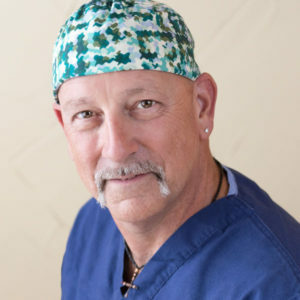 In 2012, he was introduced to medical mission volunteerism and has been making routine trips to Guatemala. In 2017, he served on the Samaritan’s Purse Disaster Assistance Response Team (DART) at their Emergency Field Hospital (EFH) in Northern Iraq. To learn more about Yancy’s personal experience in Iraq, click here to read his article entitled Privileged to Serve, which was published in the December 2017 issue of The Surgical Technologist. Yancy’s story can be found on page 32 of the link or page 560 of the original publication. Yancy specifically talks about his experience as part of the DART team working in the EFH in Iraq, and his article is so inspiring. In addition to Yancy’s Plenary Session segment, M3 is also highlighting disaster response in other areas of the conference. We will host a Pre-Conference Workshop that will provide DART training, which we will share more about at a later date. Also, Samaritan’s Purse will set up an Emergency Field Hospital for conference attendees to experience, walk through, and ask questions about what it is like to work on the field in this type of situation. You do not want to miss it! At the M3 Conference on February 23 & 24, Yancy will be speaking on the topic, “Privileged to Serve,” and we look forward to seeing you there! Click here to register and use promo code SPREADTHEWORDM318 to receive $5 off your registration. Sandra Harris was one of 19 who climbed Mount Kilimanjaro this last August with Child Legacy International’s Clean Water Climb. 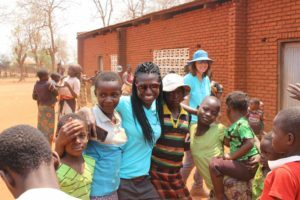 M3 was honored to sit down with Sandra to learn more about what called her to missions and the blessings she received from going on this trip. We hope this Q&A inspires you and gives you some insight on how to take that first step! Q: When were you called to missions? A: When I was graduating high school, I knew for sure that I wanted to join the Peace Corps. However, my mom said, “You’re going to go to college to get a degree first, and then you can figure out what you want to do.” So, I put the Peace Corps dream on hold, and as can happen, life got in the way. Fast forward to when I was about 33 years old, I was sitting at my desk working on my computer and all of a sudden this thought popped into my head, “Is this all there is to life?” Looking back, I really believe that was the Holy Spirit saying, “Hello! Remember back when you had a passion in your heart for serving people?” At this point, I wasn’t active in my faith; I believed in God, but I wasn’t actively pursuing Him. It was that one simple thought that got me going in the right direction. Then, in 2006, I was laid off from work, and that gave me the opportunity to spend a lot more time with God and try to figure out what I really wanted to do with my life. In my conversations with the Lord, He reminded me of my desire to join the Peace Corps, to help others, to serve others, and it became very clear to me that was my heart’s desire. Q: What was your first step once you decided to do missions? A: Driven by this revived passion within me, I literally started googling the types of things that spoke to my heart to see what job descriptions came up. During all of my searches, I kept running across MSW (Master of Social Work) and M.P.H. (Master of Public Health). It was then that I decided that I needed to go back to school, but I wasn’t quite ready to do that yet. In the interim, I did a short-term one-month mission trip to Mexico in the summer of 2006, where I was able to live with a local family. That sealed the deal. Shortly after that, I agreed to go teach English in South Korea for a year. However, while I was there, my sister became ill, so I came back home after three months. That’s when I decided it was time to go back to school. I chose to pursue a MSW because that degree best matched the description of what I felt called to do – to help the least of these, the poor, the widow, the orphan. I would like to add that as I was allowing God to direct my steps and reorient my life, my family and friends thought I was having a midlife crisis. So, if anyone reading this is in that place right now – pursuing a God-given dream that everyone else thinks is crazy – I want to encourage you to hang in there with God and trust Him. 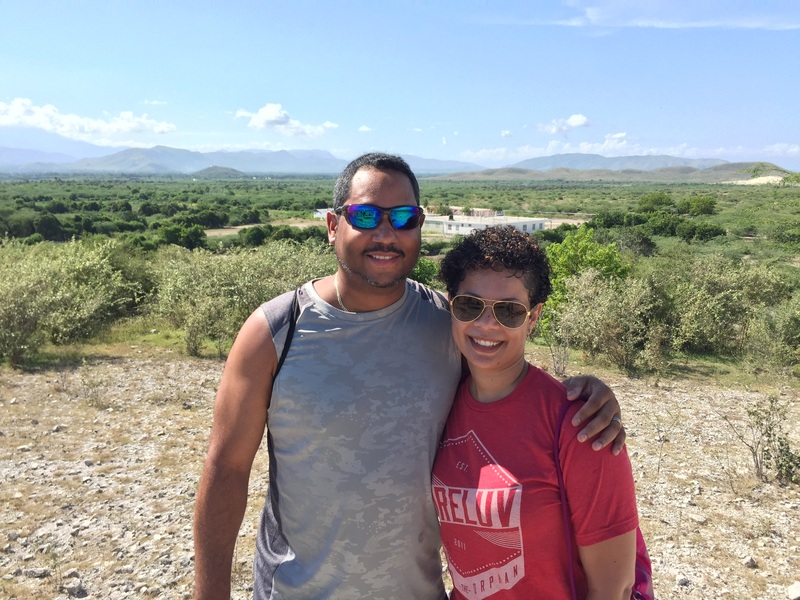 Q: How did you connect with Child Legacy International’s Clean Water Climb? A: It also goes back to my childhood. You know that story where the little girl goes to live in the hills with her grandfather? I loved that story of Heidi. I would just think, “I want to go climb a mountain one day.” I was like 12 at the time, and as I mentioned before, life happened and that childhood dream was forgotten. Many years later, a friend of mine who I had went to Kenya with on another mission trip, invited me to join her and others to go climb Mt. Kilimanjaro. So, we planned it, but for some reason the trip didn’t come to fruition. I realize now that this was another of God’s reminders to me of the dreams He placed in my heart as a child to keep me heading in the right direction. Fueled by this renewed dream, I started asking people about climbing Mt. Kilimanjaro, and one of my colleagues told me about Joël Malm, who by the way, has spoken at both the 2016 and 2017 M3 Conferences. She told me that he helps coordinate these kind of trips, and it just so happened that she saw Joël the next day and mentioned my inquiry to him. Joël immediately connected me with Mike Navolio, who heads up the Clean Water Climb team. I went to meet with Mike, and at the meeting, he told me all about the climb up Mt. Kilimanjaro and how it was a fundraiser to bring clean water to the people of Malawi. I was told that through these climbs, Child Legacy International had already built and repaired enough water wells over a 7-10 year period to cover half of the population of Malawi! That meant by supporting this initiative, within my lifetime, a complete nation could have clean water to drink. Who doesn’t want to be a part of that? I certainly did, and that was the beginning of my journey to Mt. Kilimanjaro with Child Legacy’s Clean Water Climb. Q: How did M3 play a part in your climb? A: On my particular climb, we had four people who found out about the climb at the M3 Conference. Then, because I was going, I had to drag some friends of mine along. So my “yes” led to other people saying “yes” too. Q: What do you think is the importance of M3? A: Above all, it is a catalyst for connecting people who have a heart to serve with the opportunities that are available, which are endless. What makes this aspect of the conference so important to me is that there was a time that I was not aware that all of these opportunities and resources existed. M3 has over 70 organizations represented in the Exhibit Hall area where conference goers can get connected, be inspired, and find their mission – just like the conference tagline says. Q: How did the climb impact your life? A: For me, this trip was monumental in so many ways. Number one, I was allowed to realize a dream. Number two, I have lupus and that has caused a little arthritis in my body. When I was first diagnosed, there were days where I couldn’t walk. To go from having arthritic pain so bad that I couldn’t walk to climbing a mountain – you know that’s all God! We may have forgotten a dream, but He never does. He Who began a good work is faithful to complete it! Q: How was your team able to raise $476,533 to provide clean water to the people of Malawi? A: We were each tasked to raise $5,000, and there were 19 people on our September team. Also, other climbing teams contributed to these funds raised – the July Mt. Kilimanjaro team, the Pike’s Peak American Summit team, and the Aconcagua team. Our leader, Mike, raised $237,361 alone! His passion and enthusiasm for helping the people of Malawi is very contagious, and it energized the rest of us to do our best to fundraise for this very important cause. I ended up raising $8,750. So again, with God all things are possible. You take those first steps, and then let Him do the rest. He’s the provider. Q: Any great stories from sharing the Gospel on the trip? A: The best part of it was the questions that the people asked. You could tell that our Bible stories resonated with them. Many of them were already Christians because Christianity has been preached throughout Africa for ages. It was so encouraging to see the fruit from the missionaries who had gone before us; their work was definitely not in vain. When you find believers in the middle of nowhere, it is evident that it is the work of God. Many times you don’t get to see the fruit from sharing the gospel with others; you just share and pray that the Holy Spirit is working in them. Our job is to share the message of the Gospel, and trust the Holy Spirit to do the rest. Q: What is your biggest piece of advice for anyone interested in medical missions? A: First, I would say to take an introductory mission trip – one that is short and close to home but at least 7 days in length. This is a good way to find out if it’s for you and if it’s something God is calling you to do, because it definitely needs to be a calling. You need to know that you are hearing from God. Some people are meant to send, some people are meant to pray, and some people are meant to go. So, test the waters and see how it goes. And last, but not least, pray about everything with a heart to seek God and His will for your life. Everything starts and ends in Him. We truly appreciate Sandra taking the time to share her heart and experience with us. We hope you have been blessed by it as much as we have. Like Sandra, if you feel called to find your mission, we invite you to join us on February 23-24 at the 2018 M3 Conference. Click here to register.